With webbed feet and rock-shredding spines, this mouse frolics all up and down the mountainous slope with the greatest of ease. This mouse can be seen tunnelling into the Mountain for a treat or two when he gets hungry. The Slope Swimmer Mouse can only be attracted with Chedd-Ore Cheese. No Charms are required to attract the Slope Swimmer Mouse. Hunters can encounter the Slope Swimmer Mouse only in the Mountain location. The Slope Swimmer Mouse drops Faceted Sugar and Iced Curds as loot which are used to craft Abominable Asiago Cheese. 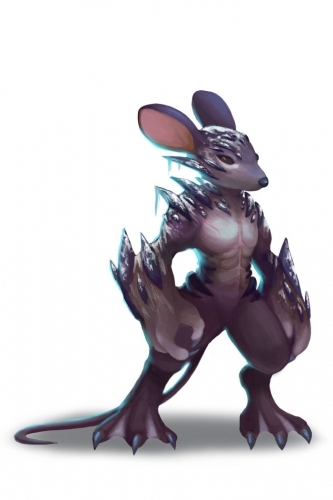 7 November 2017: The Slope Swimmer Mouse was introduced as part of the Mountain overhaul. 17 October 2018: The Slope Swimmer Mouse changed mouse groups from Indigenous Mice to Mountain Mice.